RIT will co-sponsor the Prosthetists Meet 3D Printers conference Sept. 28 at Johns Hopkins Hospital in Baltimore, along with several other nationally recognized organizations. The event will highlight the work of e-NABLE, an online community created by RIT research scientist Jon Schull (pictured above) that is devoted to developing inexpensive 3D-printed prostheses for people in need. Several nationally recognized organizations are coming together to sponsor a day-long conference highlighting the work of e-NABLE, an online volunteer community founded by a Rochester Institute of Technology research scientist that is leading the way by developing inexpensive 3D-printed prostheses for children and adults in need. The Prosthetists Meet 3D Printers conference will be held Sunday, Sept. 28, in the Turner Auditorium Concourse at Johns Hopkins Hospital in Baltimore. It will bring together thought leaders in medicine, industry and public policy and will culminate in several children with upper limb disabilities receiving donated prostheses. 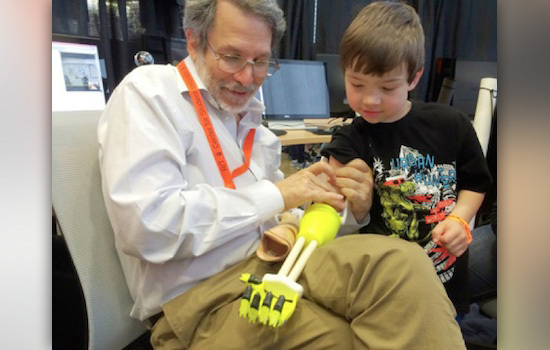 “This should be a watershed event for the prosthetics and 3D-printing industries, as well as for volunteers, academics and policy-makers helping to democratize access and accelerate innovation in prosthetics and humanitarian technological collaboration,” said Jon Schull, founder of e-NABLE and a research scientist at RIT’s Center of Media, Arts, Games, Innovation and Creativity (MAGIC). Schull created e-NABLE in 2013 to bring together 3D-printing hobbyists and professionals with people in need of prostheses. While a custom prosthetic devices can cost more than $10,000, a mechanical 3D-printed hand can be made using free designs available online and about $50 worth of materials. Today, Schull works along with RIT students to improve prosthetic designs and donate hands to local residents in need. The conference will feature hands-on workshops for prosthetists, children and their parents, at which experts will demonstrate how to print and assemble the inexpensive mechanical hands. Policy analysts will discuss the vital role that 3D printing can play in delivering affordable healthcare, in advance of the Federal Drug Administration Public Workshop on Additive Manufacturing of Medical Devices in October. There will also be presentations by medical and industry leaders and innovators, as well as by children and adults who actually use prostheses. Schull’s talk will focus on the how the e-NABLE project hopes to provide prostheses for children and underserved populations around the world using its new approach to crowd-sourced humanitarian innovation. Dr. Albert Chi, a trauma surgeon at Johns Hopkins Hospital, Lieutenant Commander in the U.S. Naval Reserve and world-renowned researcher on state-of-the-art prostheses, will be another one of the many speakers at the conference. Other sponsors for the conference include Johns Hopkins University, manufacturers of open-source 3D printers Ultimaker, the prosthetics firm Dankmeyer Inc., the Mercatus Center of George Mason University and the University of Wisconsin-Milwaukee. The event is open to the public. Registration is free for children, parents and recipients, and available at a discounted rate for professionals. To register, go to enabling3dpp2014.sched.org/.